We have about 20 canoes for rent. 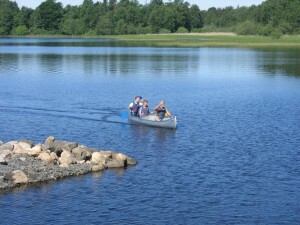 Choose to explore the lake Bolmen with its 365 island or paddle all the way to Laholm. You will find campsites with toilettes, fire places, wood and water available during the entire way. We also rent out tents, trangias and waterproof barrels. The distances are suitable for both families and groups. To paddle is an experience! If you wish to paddle you can choose between staying here at the lake Bolmen or paddle along the rivers Bolmån and Lagan to Laholm. 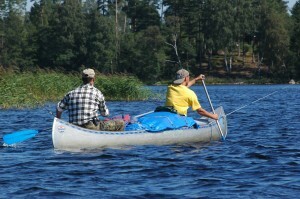 During the entire way there are camp-sites for canoers. You will find garbage disposal facilities, fire-wood, fire places and fresh drinking water. There is also canoe maps and topographic maps to buy. Our fee includes a canoeing school where we amongst others will teach you paddeling techniques and safety, how to pack your canoe – yes, all that you need to know before you take off. Skicka ett brev, fax eller E-mail för förfrågan, beställning eller offert. Send us a letter, fax or E-mail for questions or to place an order. You find the addresses at the bottom of this page. Further information is also available on our contact page!